Diagnoptics (Groningen, the Netherlands) was the first company in the world to introduce a non-invasive technology to assess the level of AGEs in tissue. The AGE Reader, which is currently being used by over 2,500 professionals around the world, provides a measurement result within 12 seconds. 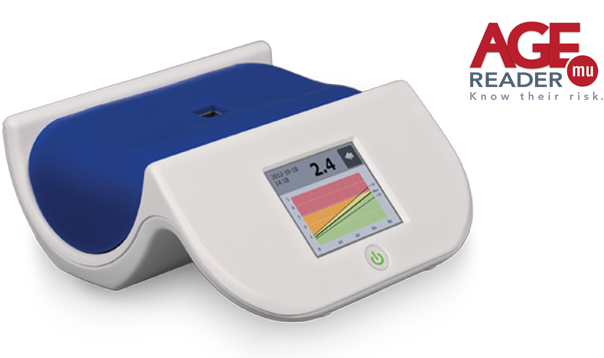 This quick and easy measurement offers valuable information about the cardiovascular risk of both diabetic and non-diabetic patients, which then allows for more patient specific therapeutic choices. The authors also provide an extensive overview of interventions against AGE accumulation. Although these are predominantly tested in preclinical contexts, they appear to show beneficial effects on the development of diabetic complications and cardiovascular diseases. Moreover, two AGE inhibitors are currently being tested in Phase 3 clinical trials. This review paper is published in Research in Cardiovascular Medicine. The authors are an international group of scientists from: Rome University of Campus Bio Medico Rome, Cardiac Surgery Centre Cardiologique du Nord de Saint-Denis, Paris and Golden Jubilee National Hospital, Clydebank, Glasgow.